There are different starting techniques to give sprinters the most power into a sprint. The shorter the sprint, the faster they have to reach full speed. Longer races do not require such a powerful start because the runner needs to pace himself, and he has a greater amount of time in which to reach maximum velocity. 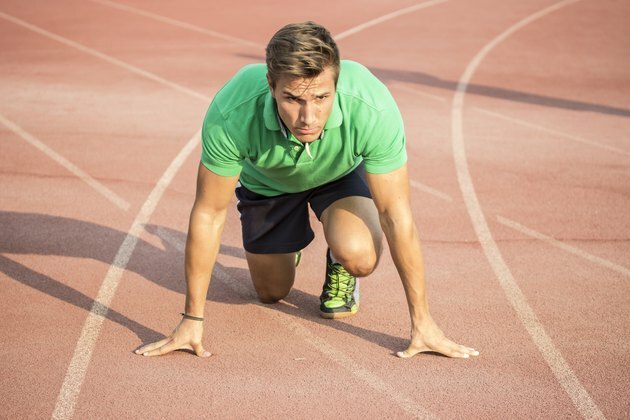 Athletes use the standing start for longer races because there is not the same urgency to power out immediately into the sprint as there is for the 40 to 400 yard races. Stand with your feet about shoulder-width apart with your more powerful leg just behind the starting line. Distribute most of your weight on the front leg. At "set," bend at the hips, but not all the way to the ground, and keep your head and chest up so that the spine is neutral. Keep your arms in opposition of your legs as they would be if you were running. The four point start is the most commonly used one in sprinting. Start in a crouch position with your front knee over and both hands on the starting line. Place your back knee on the ground next to your front ankle. On the "set" extend both legs so that your hips are slightly higher than your shoulders. Lean your shoulders slightly over the starting line. Bend your front knee about 90 degrees and your back knee about 110 to 130 degrees. Distribute the majority of your body weight between your hands and front leg. Athletes use blocks under their feet to avoid slipping during the first movement of the sprint. They also help the officials detect false starts. Athletes traditionally use blocks for sprints that are 400 m or less, so they can get as quick of a start as possible. The stance is similar to the four point stance; space the blocks so that the front leg is bent at 90 degrees and the back leg bent at 120 degrees. This start is similar to the four point start except only one arm is on the ground. Start with your strongest, most powerful leg in front, and same arm off the ground. For example, if you start with your left leg in front, then start with the left arm up as if doing a backward swing during your sprint. Your right fingers are on the ground with a small amount of weight on them. Keep the majority of your weight on your legs.